Best prices on WeatherBeeta Detach-A-Neck Fly Sheet summer protection for your horse from insects and harmful UV rays. Keep your horse cool and happy this summer. 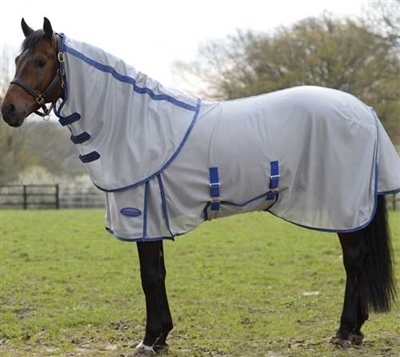 Protect your horse from insects and help them stay cool this summer with this soft durable mesh polyester fly sheet featuring elasticized, adjustable belly wrap, with full wrap tail flap with traditional side gussets for freedom. As well as having Ezi-Clip front closure and adjustable and removable leg straps.